Apart from natural sights, the area is rich with flora and fauna. There are above 1200 plants with around 40 orchids and 9 species of rhododendron the national flower. There are around 100 mammals including the rare snow leopard and blue sheep in the upper sub-alpine area, 478 species of birds such as the protected multi coloured Impheyan, koklas and blood pheasants. 39 reptiles and 22 amphibians and many types of butterflies in the area. ACAP is spread out in 5 districts of the Western Development Region of Nepal and covers 55 Village Development Committees. ACAP is divided into seven unit conservation offices located in the field - Jomsom, Manang, Lho Manthang in the Northern Program section and Bhujung, Lwang, Sikles and Ghandruk in the Southern Program section. 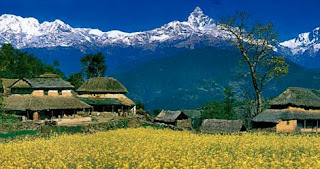 While the focus of Jomsom, Manang and Ghandruk, which are also popular areas for trekking, is on integrated tourism management and agro-pastoralism, the programme priorities for Bhujung, Sikles and Lwang are poverty alleviation and integrated agriculture and livestock development, agroforestry, and community development respectively. While the focus in Lho Manthang, Upper Mustang, which came under the jurisdiction of ACAP in 1992, has been on managing controlled tourism on a sustainable basis, and promoting heritage conservation which is the major tourist attraction along with alternative energy, resource conservation and community development programmes. The Conservation Education and Extension Project (CEEP) is being implemented in the entire ACA and forms the backbone of all its conservation efforts in the region.